Brewing beer offers endless, fascinating possibilities. However, while the search for the next great combination of ingredients, techniques, and philosophy can inspire, it can also complicate with its infinite variations. Finding the right approach, where ideas can be evaluated, ingredients analyzed, and techniques tested is essential to the continued growth and understanding of our craft. 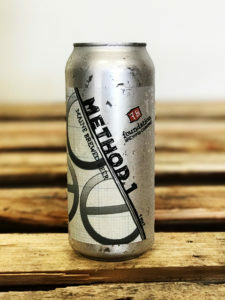 To this end, we are happy to introduce Method, a series of rotating beers brewed to investigate these questions on a production scale, that will be offered as both draft and cans only in our tasting room. Our first iteration, Method 1, is an India Pale Ale brewed to evaluate the effects of dry hopping at the earliest stages of fermentation. Brewed with a simple grist of pale malt and approximately 15% flaked barley, and featuring Citra, Cascade, Chinook, and Columbus, we introduced half of the dry hops into the fermenter on the day we brewed the beer, simultaneously with our house yeast. The end result is an incredibly fruity, aromatic IPA with startling clarity for a beer that contains unmalted grains and was never fined or filtered.